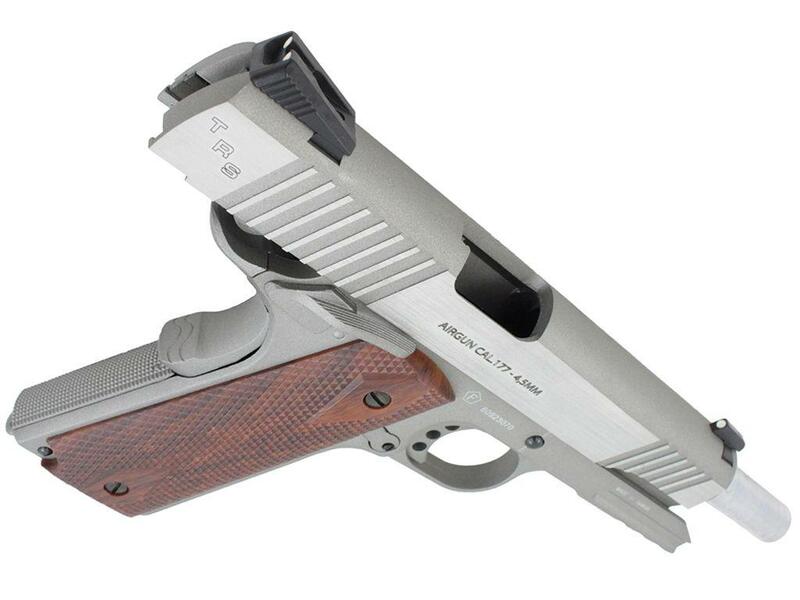 Swiss Arms SA1911 TRS CO2 BB Pistol | ReplicaAirguns.ca | Easter Weekend Sale! 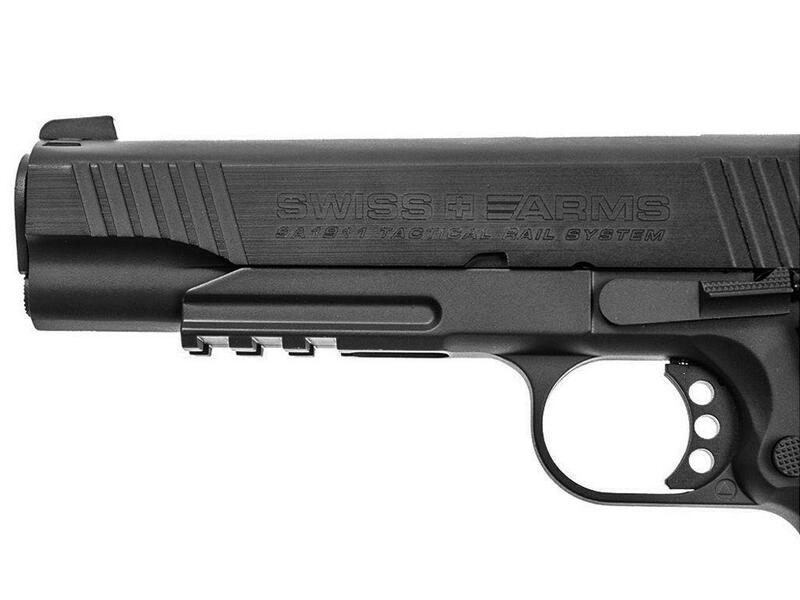 Comments: The Swiss Arms SA1911 BB pistol series are the closest thing you can find to the real thing. 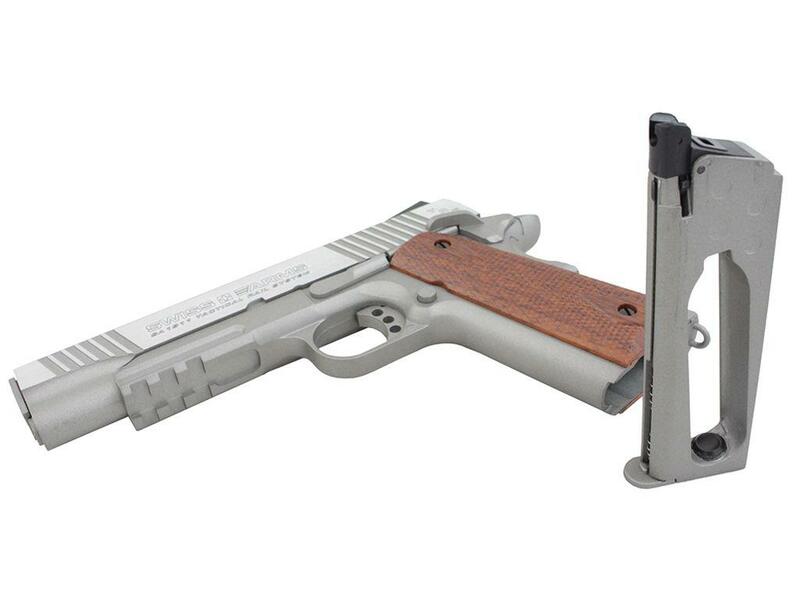 This 4.5mm CO2 airgun includes all the same features as the real steel 1911, including a beavertail grip, slide serrations, and drop free magazine. The TRS (Tactical Rail System) model features a lower 20mm Picatinny rail, so you can enhance your shooting sessions with a laser sight or flashlight mount. 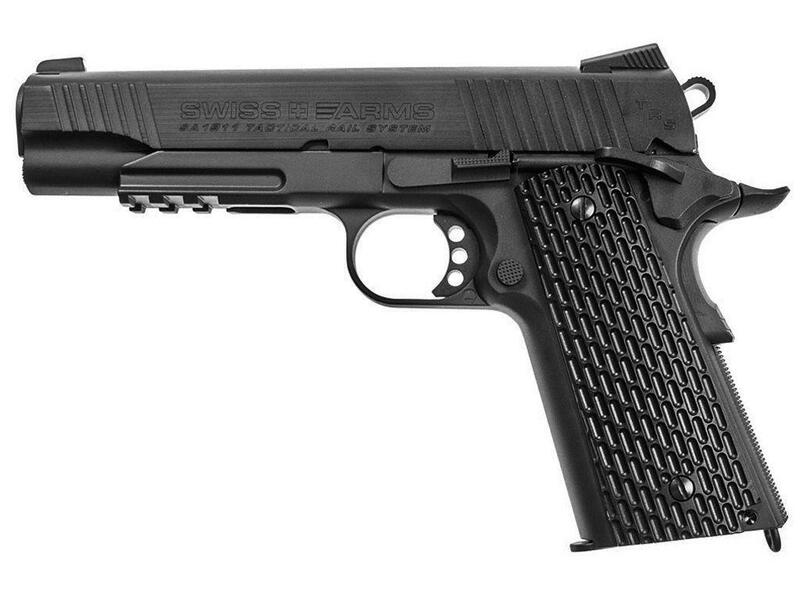 Very detailed replica, works and takes down like a real 1911. I have to say it is fantastic! 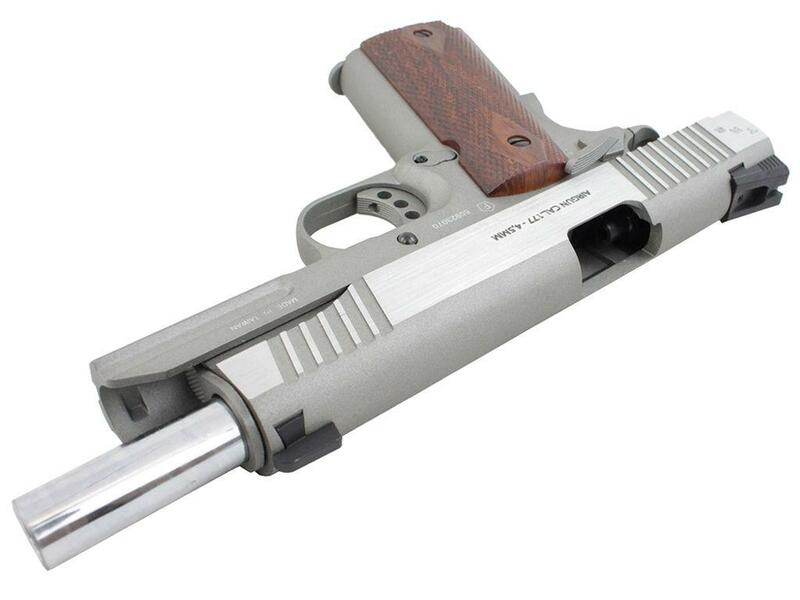 If you like 1911's this is a must have, especially in this finish. It is beautiful. Very realistic to use too! 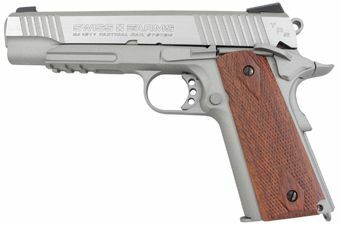 It's feels a little lighter than a real 1911 though, but I think it might be because of some of the aluminum parts in it that are lighter weight. The slide is not stainless but rather aluminum like the rest of the frame but it still feels overall very realistic. The blow back is awesome on this, it actually kicks a little bit too which is neat. The trigger is nice and crisp. Sights are not adjustable (as far as I can tell), but mine shoots pretty much dead on target out of the box. I do like the white dots too because it makes sighting easier especially on dark targets. The fps seems the same as advertised, which is great considering it's a full blowback model. I get a little over 3 mags per co2 cartridge with it. Accuracy is decent for a bb gun seems to shoot roughly just over 2 inch groups from 8-10 yards but at further distances you might start to get a few more flyers like you would with most bb pistols. 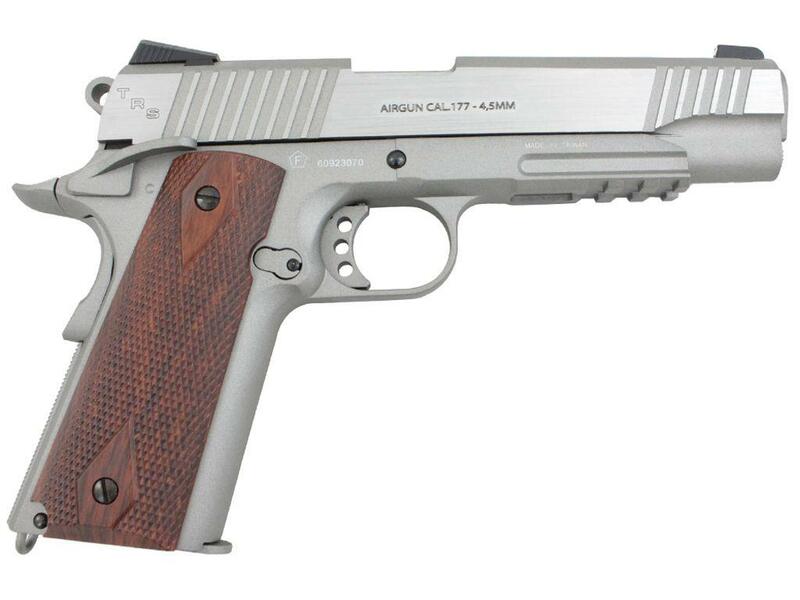 For a gun with blowback and bb's it is pretty darn good. If I were to really nit pick I would say it'd be nice to have the groups slightly tighter but I'm not complaining as 2 inch groups are pretty standard for these types of autoloader blowbacks. It works well enough for what its for. Reloading is pretty easy if you have finger nails to hold the follower down. I gave it 5 stars because it looks amazing and is super fun to shoot, fits really nice in the hand. Its a superb replica for sure. I've put about 12 or so mags through it now and it has functioned flawlessly. No jamming, leaky mags or other issues so far. Like the manual says, it's good to apply pellgun oil or rws chamber lube to the top of the c02 each time you put one in to prevent the seals from drying out. 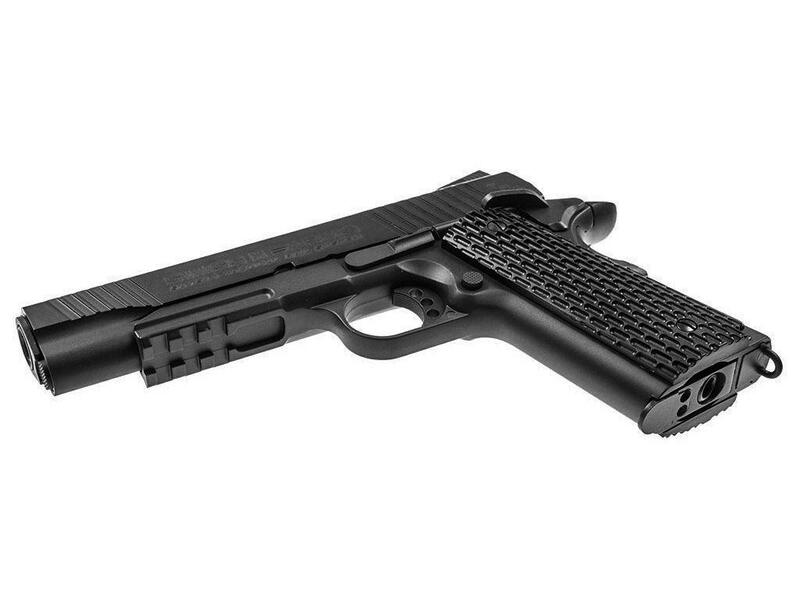 It is a must-have fantastic little 1911 replica If I were to change anything there are only a few small things, but none of them are really issues to be honest. The finish does hold relatively well but where parts have friction it does seem to wear a little bit. Luckily on this silver version it really isn't noticeable unless you're looking for it. On a black version it would really show more, and honestly it does seem to hold up much better than the black paint on other models I've seen. On this particular model its so minimal that I wouldn't worry about it. It seems all KWC airguns have this wearing on the finish to some extent. 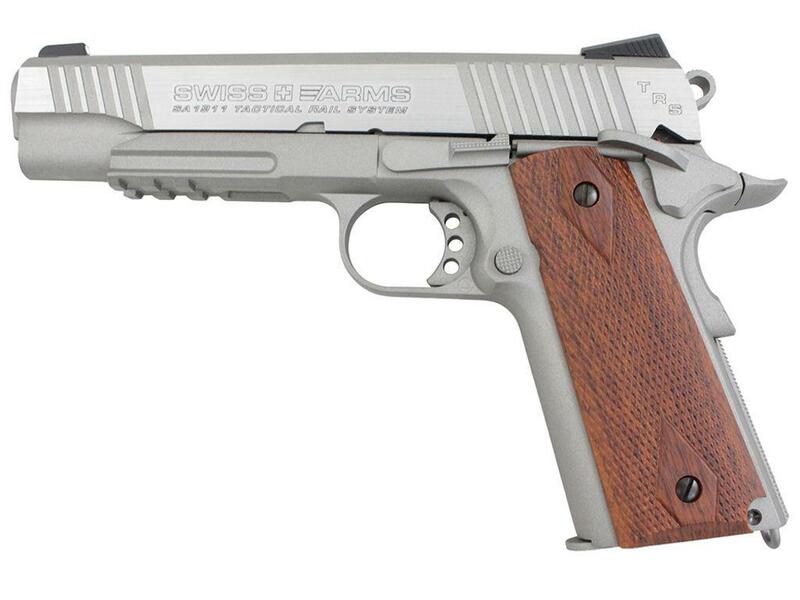 It comes with plastic grips, but it would be cool if they came with wood grips. 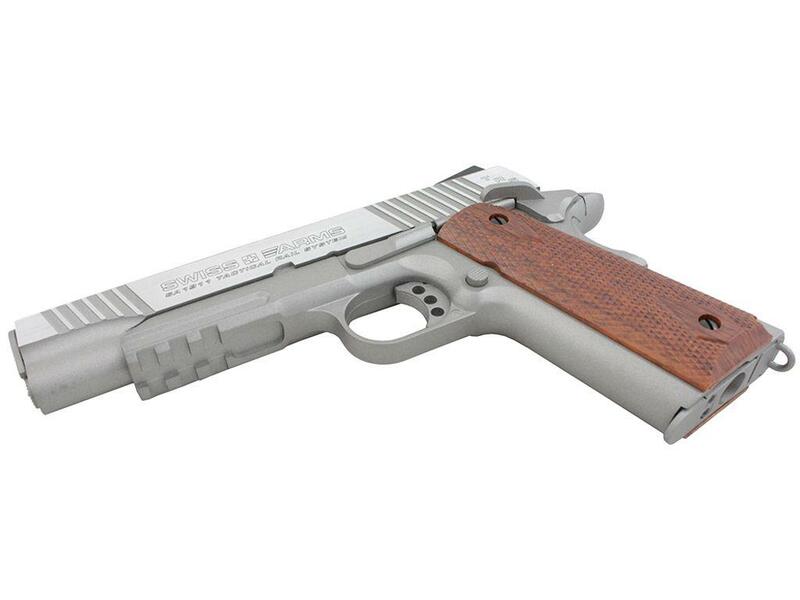 Luckily you can buy beautiful 1911 grips separately that are wood that look amazing and fit this model (but may require some grinding). I will probably put those on this one. 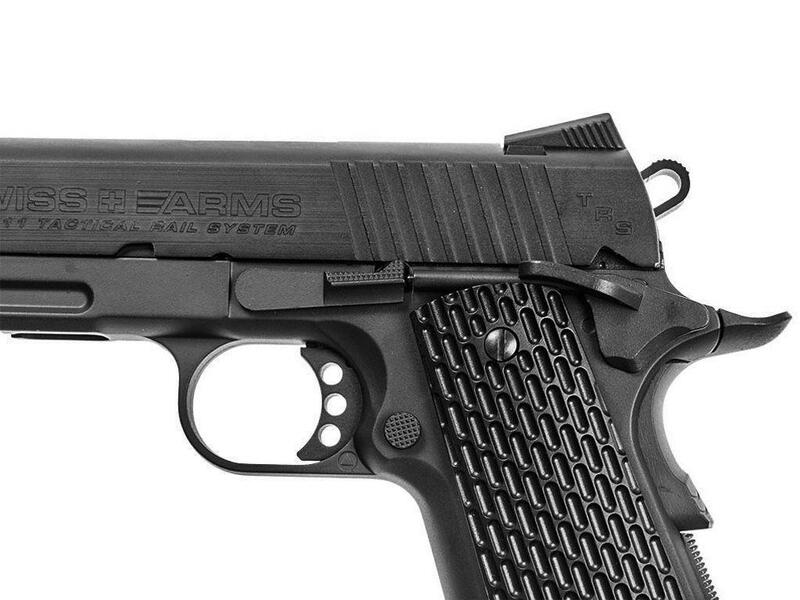 I'm just happy that real 1911 grips fit on this which I think is pretty great. The metal used on it seems to be aluminum, would have been cool if it were a heavier steel but the added weight would likely affect the blowback, but I mean it is an all metal design with decent weight so that alone is awesome - so I really can't complain. So there really aren't any actual issues. Like I say, performance wise it's excellent. 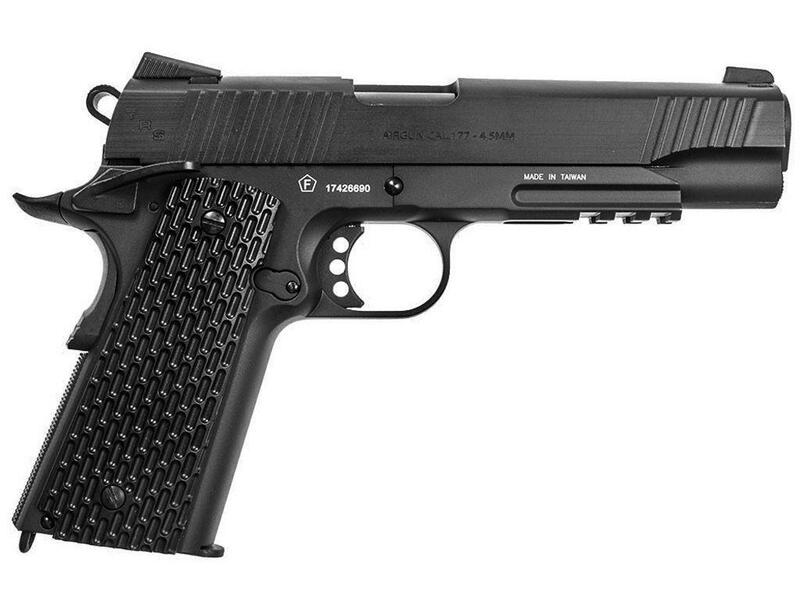 So I'd say this 1911 replica is must have. I would highly recommend. I'm glad I purchased it, replicaairguns shipped it out really fast too. I'm completely happy with it and would recommend it to anyone who likes 1911's. I'm so very glad I got this one with the stainless look to it too. In real life it looks more sharp than in the pics I'd say. You can't go wrong with this model. 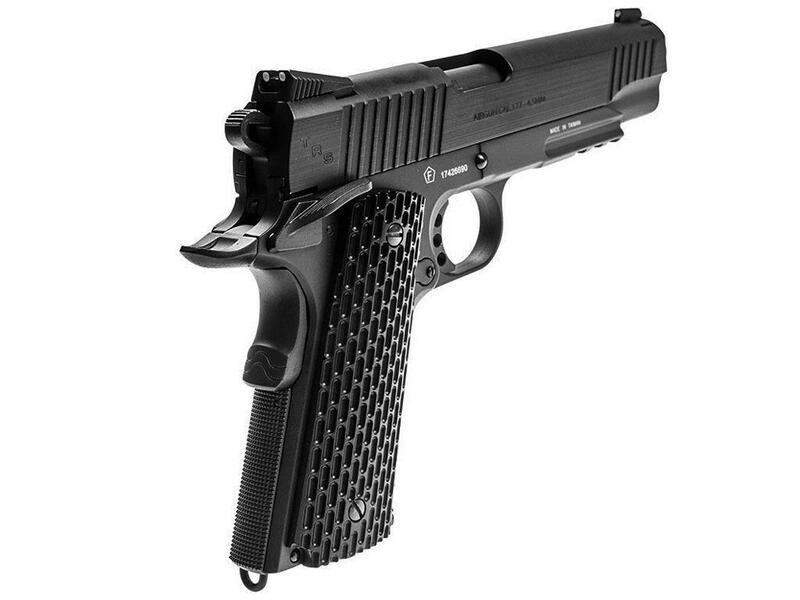 That's why I think it's super cool that now you can get your already blinged out and polished Cybergun/KWC 1911 or PT92 and really for not a lot more money at the end of the day! The real problems is availability since these stainless versions are in high demand.